David Pagnotta: With the Toronto Maple Leafs at MSG last night, GM Kyle Dubas took in the afternoon Islanders-Wild and was in GM Lou Lamoriello’s suite. Dennis Bernstein: David Pagnotta noted that a Montreal Canadiens scout watched the entire game which is not the normal routine as scouts usually leave early in the third period. Speculating that they were focusing on Kings players. 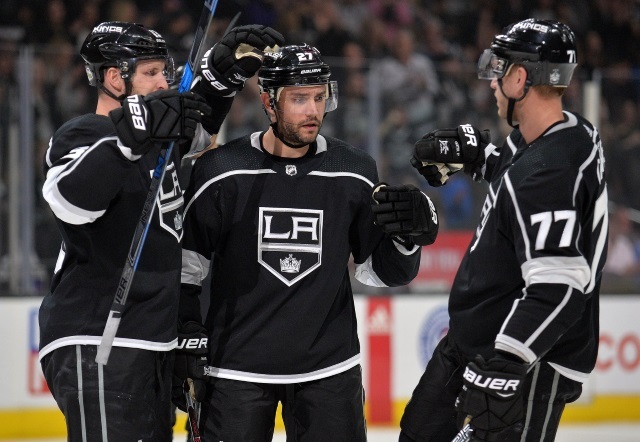 Dennis Bernstein: Los Angeles Kings forward Jeff Carter could help a contending team and believes that the trade talk has affected his game this season. A fresh start with a contender may be refreshing for him. A trade should net the Kings a couple of assets, which shouldn’t prohibit any deal. Dennis Bernstein: Defenseman Dion Phaneuf has a no-movement clause and he’s not going anywhere. Chris Nichols of Nichols on Hockey: Darren Dreger was on WGR 550 talking about offers and potential trades this offseason. Offer sheets may not just be big named players, but possibly lower-tiered offer sheets as well. Teams near the top that will be tight to the cap include the Tampa Bay Lightning, Toronto Maple Leafs, Winnipeg Jets, and Calgary Flames. “What I think is going to happen – and this is just my gut instinct here – those teams are also the teams that are most hungry to win. So I’m not suggesting that you’re going to see big, young pieces trades between now and February 25, but I wouldn’t be surprised if we start seeing some really significant trades on an annual basis at the draft.